I love DVDs! Where else can you get nearly four hours worth of education and entertainment mixed in high-quality 5.1 Surround Sound for the price of a single drum lesson? As for the star of this particular DVD, Marco Minnemann is a drummer who has been touring and recording with artists worldwide for a number of years. Some claim that Marco has been "genetically engineered," but that's not giving the credit to Marco. I say that he's a drummer who loves his art and has practiced many long hours to develop his technique and interdependence skills to an extremely high level. As this DVD reveals, regardless of musical style or time signature, Marco negotiates his way through each and every chart and challenge - no matter how complex - with the ease of a true "artist" drummer. 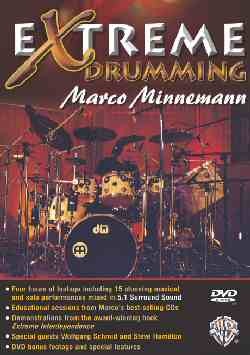 Let's take a look at Marco's DVD, Extreme Drumming, from Warner Bros. Publications. Marco performs some of the songs with a live band consisting of Steve Hamilton on acoustic piano and Wolfgang Schmid on electric bass, and others with pre-recorded soundtracks from his various CDs. Although Marco's performances on this DVD will no doubt entertain and astound, it is not just a performance DVD, it is also educational. This DVD really allows us to get into Marco's head as far as his approach to music composition and drumming is concerned. Marco explains how he was heavily influenced by Frank Zappa's music and how he also loved to experiment with music programs on computers, programming as many complex patterns as he could and then trying to play along with his drums to see if he could "beat the machine." There are plenty of drum solo performances on the DVD to appease the most solo-crazed drummer. If you've ever worked with Marco's book Extreme Interdependence, also from Warner Bros. Publications, you'll recognize Marco's use of many of those techniques in his grooves and solo work on this DVD. Feeling and Phrasing: Marco's approach to the creation of his drum patterns in odd time signatures with the use of sampled loops. Very cool! Extreme Practice Routine: Marco explains how he practices to develop his extreme interdependence, which includes not only playing various rhythmic patterns using each limb at the same time but playing in multiple time signatures simultaneously as well! Finger Control Technique: Marco briefly demonstrates his finger technique and his variation on the Moeller system for accenting. Stick Tricks: As Marco says, "you really don't need it because you don't hear it in a studio but it's fun to do!" And I agree. Marco demonstrates his backsticking style, his original stick click tricks, Buddy Rich's favorite stick trick, and more. Fun stuff and useful for the "show" thing. Interdependence Workshop: These are the exercises Marco uses to improve his own interdependence skills. It consists of playing different combinations of basic patterns with various limbs while soloing against them with the limb or limbs of your choice. Book Excerpts: Marco plays selected exercises from his book, Extreme Interdependence, which is also available from Warner Bros.
Interview with Wolfgang Schmid: Wolfgang, the bass player on this DVD, talks about Marco. Interview with Steve Hamilton: Steve, the pianist on this DVD, recalls his first meeting with Marco and how he came to work with him on this project. Alternate Takes & Rehearsals: There are some alternate takes and rehearsals of the songs performed on side one. Behind The Video: Some fun behind the scenes stuff filmed while making the DVD includes bits with Rick Gratton playing along with Marco, Marco soloing, Marco's impression of Dom Famularo, control room antics, a late night after-filming jam session, and lots more behind the scenes shenanigans. Even James Brown puts in an appearance, well, sort of! Artists Biographies: Bios of Marco Minnemann, Wolfgang Schmid, and Steve Hamilton. Marco's Discography: A listing of his CDs along with sample audios from each. Photo Gallery: Stills taken during the making of the DVD. Interactive Drum Set: You can check out the specifics of each of Marco's DW drums and all of his Meinl cymbals. Browse the WB Catalog: A synopsis of six drum books from Warner Bros. Publications. Put this DVD-ROM into your computer and you can access additional video clips, 15 pages of solo excerpts, ostinatos, selected grooves, three transcribed charts and three MP3 files featuring selections from Marco's solo CD catalog. I've been in the drumming field for a "few" years and I must admit that I'm not easily impressed by many drummers. But I feel that Marco Minnemann is one of the few who deserve the title of "Artist Drummer." I can tell that he has spent many hours woodshedding on his instrument and developing his creativity and this DVD provides the ideal showcase for his talents. I'm sure we'll be hearing a lot more great things from Marco in the future. A huge thumbs up to Marco and his DVD, Extreme Drumming. This is great stuff that all drummers will be able to benefit from, regardless of experience level.